ST. LOUIS – Singing “Alleluia” took on a new meaning on Easter for many parishioners after a tornado on Good Friday leveled homes, tore roofs and walls off others and caused a wide assortment of other property damage. The tornadoes that hit parts of the St. Louis Archdiocese April 22 struck first in New Melle before ripping through the Bridgeton area and cutting a path through North St. Louis County and heading across the Mississippi River into Illinois. Easter is a time to be grateful that no one was seriously injured and “celebrate the victory of Our Lord over death, a victory that also is ours,” Father Richard Bockskopf, pastor of Holy Spirit Parish in Maryland Heights, said at the beginning of an Easter Sunday Mass there. 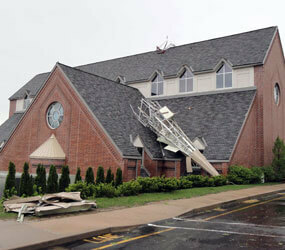 During a Good Friday service at Holy Spirit, associate pastor Father Joseph Classen and others saw the church’s 40-foot steeple fly by one of the windows as the tornado hit. Holy Spirit parishioners interviewed before and after Masses April 24 noted they were still traumatized by the event, were grateful that they and others survived, and were impressed that others rallied to extend a helping hand to those in need. Ellen Staples and her family reflected on what has happened since they emerged from taking refuge in their basement during the storm and found their neighborhood torn apart. The Staples’ home was damaged by a fallen tree. “It was a blessing that, though our house was hurt, it was not so bad. We’re fine. So many other people are worse off,” she told the St. Louis Review, newspaper of the St. Louis Archdiocese. People from their parish and from her former parish have responded as well as neighbors and strangers, including a Southern Baptist Relief group. “We had 15 people in our backyard helping and others bringing food,” she said, noting that they planned on spending Easter afternoon doing more clean up. “It was an eventful Easter break from school,” said Mary Rae Staples, who had returned to her parents’ home from Rockhurst University in Kansas City just hours before the storm hit. The college student was being visited by a friend, Kelsey Hayes, when the tornado hit. Hayes’ home was destroyed and her family was living with relatives, Mary Rae Staples said. Father Bockskopf said he worked on his Easter homily earlier Friday and reflected on the earthquake that happened when Jesus rose from the dead, thinking of the incredible power that nature has, sometimes for good and other times for destruction. Jesus’ rising from the dead was powerful in other ways, too, the parish pastor said in his homily. Father Bockskopf noted how tornado victims told him they are thankful for the aid they’ve received. That help is one way God makes his presence known, he noted. Immediately after two tornadoes hit the St. Louis area on Good Friday evening, the archdiocese’s Emergency Response Committee was mobilized. Archbishop Robert J. Carlson formed the committee, which includes leadership of the archdiocesan curia, to respond to emergency situations, such as natural disasters, and to provide support to parishes and their communities as they recover. The National Weather Service confirmed that two tornadoes hit an area spanning from New Melle in St. Charles County to Granite City, Ill. The National Weather Service reported that the second tornado, the worst of the two, packed winds of 166-200 mph, and was the strongest that has occurred in St. Louis County since 1967. No deaths or serious injuries were reported. Initial news coverage said 750 homes were damaged or destroyed, but later reports said it was likely that thousands of homes had suffered damage. The winds left neighborhoods littered with debris. Lambert International Airport in St. Louis also suffered damage, leading to its closure for about 48 hours. Catholic Charities was preparing to supplement services offered by the Red Cross and the Salvation Army, as well as address people’s long-term needs, said Karen Wallensak, a member of the Emergency Response Committee and director of Catholic Charities Housing Resource Center. “This is all part of a community-wide effort. Catholic Charities is among many service providers, each has its own niche and one major effort is not to duplicate each other’s services,” she told the Review.